Don’t exceed the scope of your food product license . . . Or else! Tabitha and Bryan Bunderson own a cat named Tarder Sauce who first became famous after internet postings of her image went viral in 2012 under the title GRUMPY CAT. Grumpy Cat Limited was formed to hold and exploit the intellectual property rights relating to Grumpy Cat, and it has registered a number of copyrights and trademarks that have been licensed for use on such items as shirts, mugs, books, pens, bags, socks, plush toys, slippers, cushions, phone cases, balloons, stickers, calendars, dinner plates, candy, towels and key rings. Grumpy Cat alleged that Grenade was authorized to sell only Grumpy Cat Grumppuccino iced coffee products but exceeded the scope of its license, after having been warned not to do so, by creating and selling a Grumpy Cat-branded ground coffee product. Grumpy Cat brought suit for willful trademark and copyright infringement, not just for breach of contract, in the U.S. District Court for the Central District of California. After a jury trial returned a verdict in favor of Grumpy Cat, the Court awarded damages totaling $710,001, consisting of statutory copyright infringement damages of $230,000; statutory trademark infringement damages of $480,000, and contract breach damages of $1. On June 22, 2018, Grumpy Cat asked the Court to award it $322,000 in attorneys’ fees. Grumpy Cat Limited v. Grenade Beverage LLC, Case No. 8:15-cv-02063, 2018 U.S. Dist. LEXIS 91342 (C.D. Calif. May 31, 2018). Grenade has appealed the ruling against it to the U.S. Court of Appeals for the Ninth Circuit. Grumpy Cat Limited v. Paul Sandford, Case No. 18-55925 (9th Cir. July 10, 2018). On August 22, 2018, District Judge David O. Carter ruled that Grumpy Cat was not entitled to attorneys’ fees on its infringement claims because Grenada had not acted frivolously or in bad faith, which are requirements under the Trademark Act. However, he also ruled that Grumpy Cat was entitled to attorneys’ fees on its breach of contract claim. Subsequent Development. In a 48-page opinion dated October 26, 2018, and filled with pictures of evidentiary submissions, the Trademark Trial and Appeal Board affirmed an Examining Attorney’s refusal to register the Grumpy Cat image as a mark for videos, games, paper goods, stuffed toys and a website. The TTAB held that, although the image functioned as a trademark, it was merely descriptive of the goods and services, since all of them were about the Tarder Sauce cat. Further, the TTAB held that the evidence did not support a finding that the mark had acquired distinctiveness as a source designation because (1) previous registrations of the same image were not for sufficiently similar or related goods or services, and (2) the social media following and website evidence promoted the cat as an “internet celebrity” but did not direct the attention of consumers to the goods and services for which registration was sought. In re Grumpy Cat Limited, Application Nos. 85838010 and 85836812 (T.T.A.B. October 26, 2018). 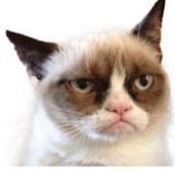 The TTAB's affirmance of the refusal to register the Grumpy Cat image as a trademark should not affect the District Court's award of $1 in damages for breach of contract or $230,000 for copyright infringement damages. But perhaps it might provide a ground for Grenade to challenge the $480,000 award of statutory trademark infringement damages.